The Dad Games of 2012 came to a close on Tuesday. We hope you dads have been challenged and encouraged as we have during these games. We enjoyed sharing stories and connecting with other dads. We expect that you are connecting with your kids in a deeper way, are being the best husband (or ex-husband) to the mother of your children, are armed with ideas for managing work and family priorities and have set goals to continue training and improving in being the best dad you can be. Let's take one last look back at highlights of what dads like you said over all five weeks of The Dad Games. Below are quotes from actual dads who took the challenge to be Gold Medal Dads. 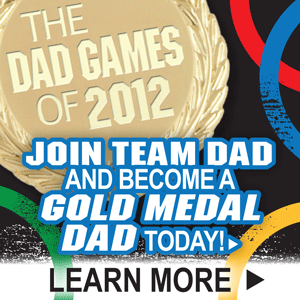 Thank you, Team Dad, for joining us in The Dad Games of 2012! We encourage you to keep training, keep connecting and consider being a Double Duty Dad. Stay tuned for more information on our next big project.